Last night was extremely hot. Sleeping was difficult and the breeze would tease us throughout the night but did not to come to anything until about 7.00am when it started to noticeably cool. But this did not last long. Just after our morning tea stop we noticed smoke starting to rise in the distance and within about 15 minutes it was obvious a fresh bushfire had started not far in front of us. 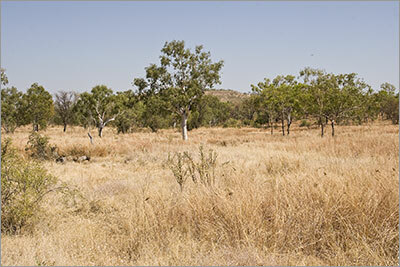 This was one of my fears of travelling through the Kimberley. 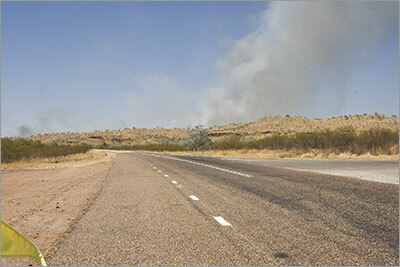 In 2005 when we drove north into Kununurra we found the last 100km burning slowly on each side of the road. Years before I had done some work that involved interviewing staff in the Western Australian Department of Conservation and Land Management about how they managed bushfires. 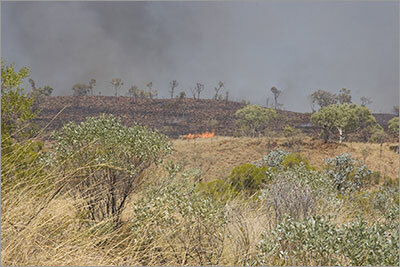 I was amazed to find that unlike in Eastern Australia where fires are attacked as soon as they are discovered, in the Kimberley they let fires burn themselves out tracking their progress on a weekly basis using satellite photos. Therefore, we approached the smoke with some trepidation. The fire had started beside the road and we are guessing a cigarette from a car was the cause. The only other alternative was that it was deliberately lit. Both causes as bad as each other. As we stopped to take photos it was amazing to watch the fire jump to the top of a hill before running along the top of the ridge in the direction we were travelling. 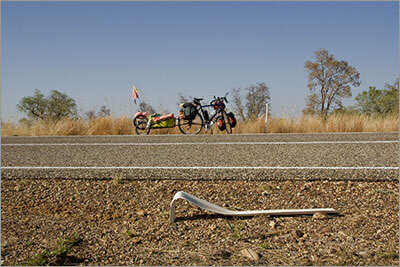 This re-awoke us to the danger and we got going in case the wind changed bringing it back to the road. The amazing thing was that only the grass was burning with many of the small low trees being left unburnt, although I suspect the leaves will turn brown over the next week or so. At the Northern Territory / Western Australia border there is a quarantine station and you cannot take fresh fruit and vegies, honey and walnuts amongst other things into Western Australia. So we had planned to have lunch at the rest area on the NT side of the border and eat our remaining fresh produce. It was amazing to see how many other travellers had the same idea. Our passage through the quarantine station after lunch was uneventful. We had feared they would ask to see inside our panniers which would have been a very time consuming check but luckily they accepted our bag of vegetable and fruit scraps and let us proceed but not before we had sampled the cold drinks in the machine outside their office. The terrain became hilly after the border – nothing too steep just gentle ups and - importantly - downs. 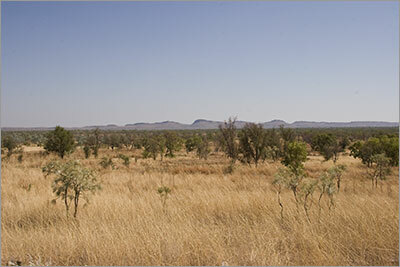 We arrived in Kununurra shortly after 5.00pm NT time. A couple of days ago we decided we would change our clocks to WA time after we had arrived in Kununurra as changing time zones is not a quick change for us. You would think a cyclist would not have that many clocks but everything we carry seems to have a clock and we complicate matters by trying to keep them all synchronised with our GPS so we can link each image or video clip to its actual location. We stopped at Coles to buy icecreams and a chocolate milk each and found we had to buy a box of four ice creams. Of course we did not have freezer so we had two each ;-). The radio this evening mentioned that the local temperatures were 5-6 degrees higher than average, which made us wonder how hot it had been over the last couple of days. 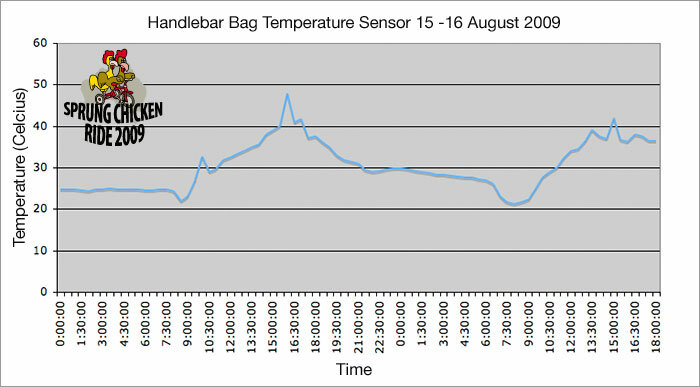 We have been carrying a temperature logger since we left Canberra and it has been recording the temperature every 30 minutes since we left. The probe is located on the right side of my bike with free access to the air. To date we have resisted the temptation to look at the data but his evening we downloaded the results for the last two days. It has not been our imagination that it gets hot around 3.00pm but our real surprise was how hot it gets in the direct sun. Yesterday at 3.30pm it registered 47 degrees and showed that it did not drop below 30 degrees until 1.30am this morning. Today at 2.30pm it was 42 degrees. It was so hot even the roadside marker posts were wilting! 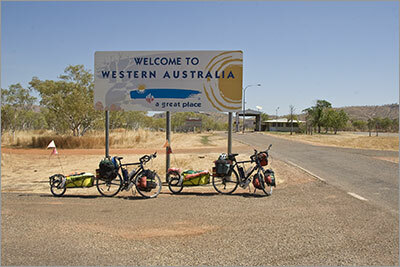 Welcome to Western Australia - our fourth state.